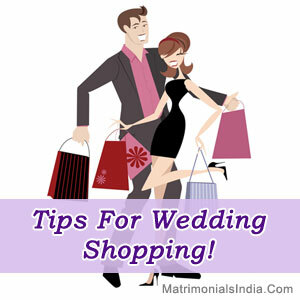 » Tips For Wedding Shopping! Assign Budget : Preparing a comprehensive budget will help you ascertain that all your material is bought within the preset expenditure. Thus, you should assign your expenditure for specific products like gifts, cosmetics, jewelry, household items etc. Make sure you include all the cosmetics, jewelry, clothes, accessories, grooming & personal care products etc. in the list you prepare. Maintain a separate list for all the gifts to be distributed to the guests. A separate list for pre and post wedding favors should be prepared. Wedding is a once in a lifetime experience. Mostly, things are arranged in hustle bustle due to the time frame and wedding jitters. So start preparing early on by looking out for wedding shows, special discounts and online shopping websites to get a good idea. The above mentioned tips should help you adjust everything carefully but don't forget to enjoy the experience. Have a happy wedding! Nice post. Thanks for sharing this article. As marriage's season is coming, these points will help a lot in making the wedding successful & comfortable. Thanks, I will surely share this site.